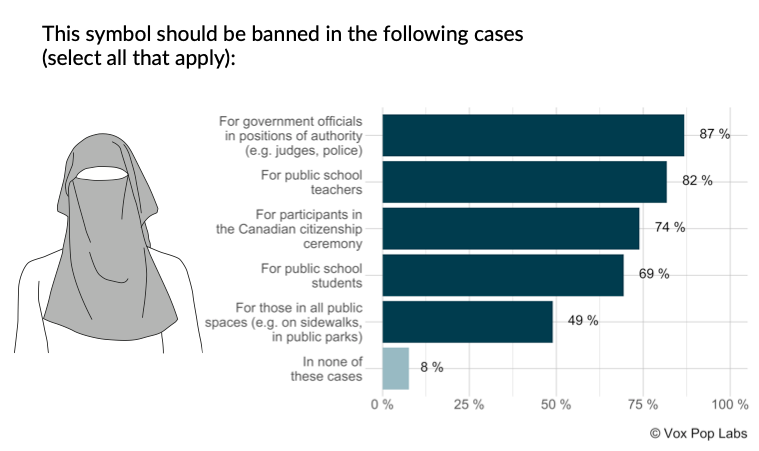 Vox Pop Labs develops innovative questions to measure Quebec public opinion on the religious symbol ban. 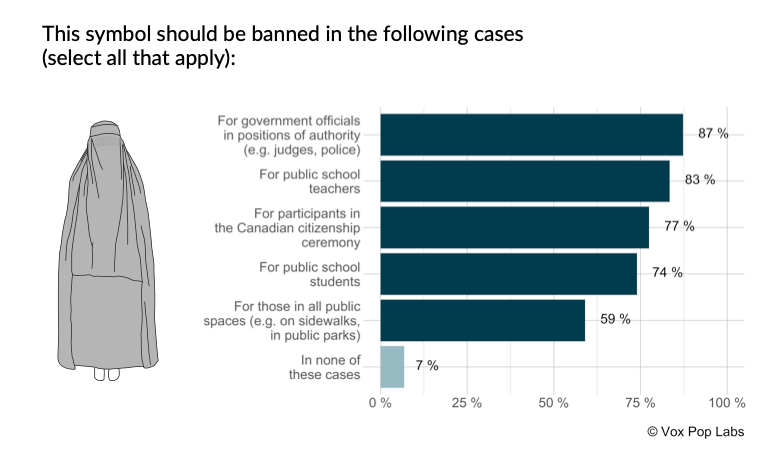 Using data from a post-electoral online survey of 4635 individuals, conducted from October 10-25, 2018, the Vox Pop Labs team has produced one of the most in-depth and innovative studies of attitudes toward religious symbols in the province. We developed new measures because we were dissatisfied with the types of questions that were being used to gauge public sentiment on this issue. These questions would typically conflate many different religious symbols in a single question, such as “Do you support or oppose a ban on religious symbols for public school teachers?” Questions asked in such a way miss a key piece of information: what people actually think of when they encounter the term “religious symbols.” Are they thinking about a full veil that covers the face, like a burqa? Or are they thinking about hijabs–veils that cover only the hair? How people interpret a blanket term like “religious symbols” will affect the results. We believed that there was also a strong possibility that many people were interpreting it as meaning more ostentatious religious symbols, such as a niqab or a burka, thus increasing support for the ban. The second reason is that we wanted to stay away from actually naming religious symbols. Not everyone knows what a kirpan or a niqab is, or how a niqab may differ from a burqa. 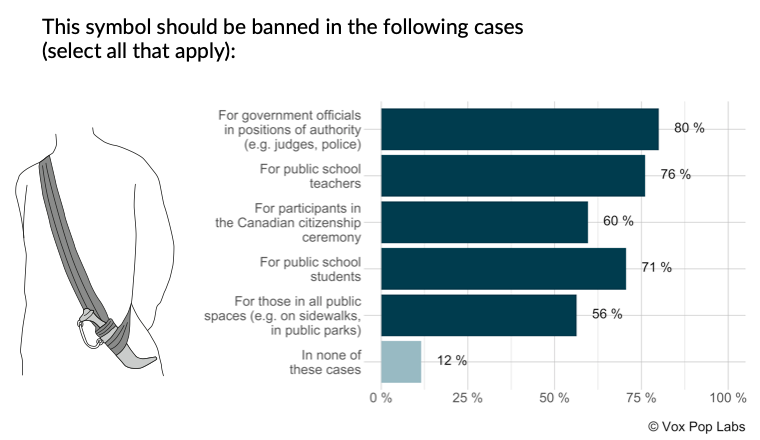 In fact, we wanted to avoid naming symbols altogether so as not to accidentally prime respondents one way or the other. The images depicted do not represent an exhaustive list of every possible religious symbol. Where their value comes from is in the fact that they span many different religions and vary in their “ostentatious” or conspicuous character. As the following results make clear, public opinion varies greatly depending on the religious symbol and the scenario in which this symbol is worn. 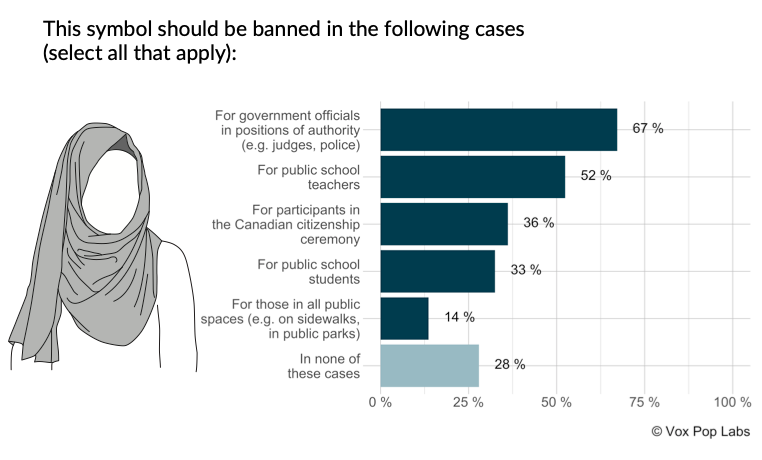 Three “groups” of symbols emerge from the data: (1) those symbols for which support for a ban is unequivoqual, (2) those on which the population is much more divided, and finally (3) those for which support for a ban is limited to government officials in positions of authority. We can combine all the decisions made by the participants to evaluate the level of support for the different policy scenarios that have been debated in Quebec. 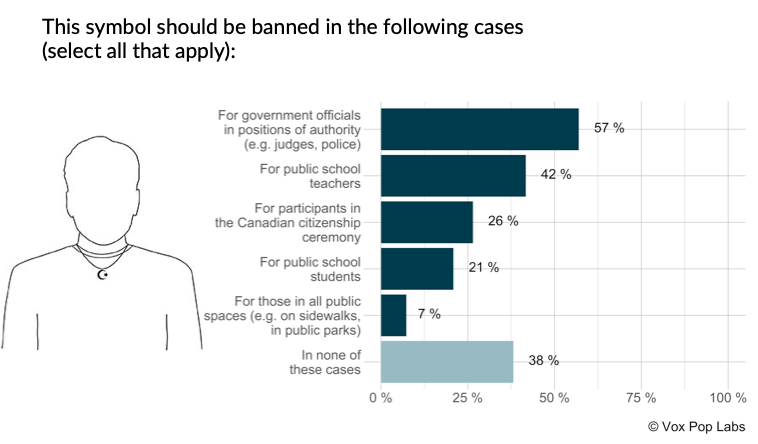 First, it is worth mentioning that 3% of Quebecers would not ban any symbol in either of the scenarios. 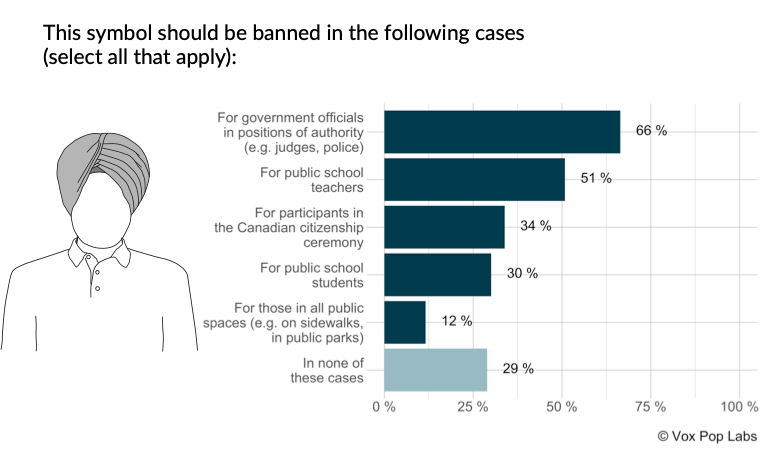 A similar proportion of respondents (4%) fall on the other end of the spectrum, choosing instead to ban all symbols in all scenarios. Overall, 55% of respondents believe that, at a minimum, officials in positions of authority should be prohibited from wearing “ostentatious” or conspicuous symbols at work–a proposition commonly viewed as the “Bouchard-Taylor consensus.” In this case, we consider all of the symbols depicted in our study to be “ostentatious,” with the exception of the three smaller necklaces. Support drops to 41% when the ban is extended to public school teachers, a scenario similar to the one currently proposed by the Legault government. We also observe striking differences across age groups. Whereas only 43% of 18-34 year olds approve of a ban on “ostentatious” symbols for government officials, this proportion increases to 60% among 35-54 year olds and 63% among those 55 and older. 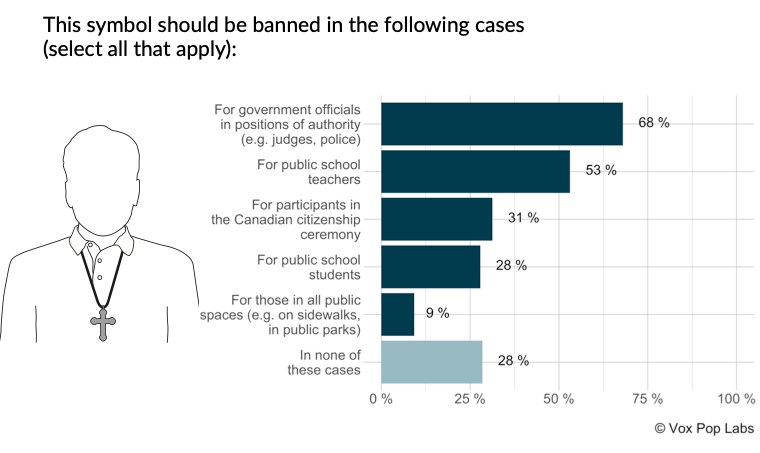 The differences are even greater when we consider the CAQ’s proposition to extend the ban to public school teachers. This scenario does not get a majority of support in any age group (49% among 55+ and 43% among 35-54) but drops to a measly 26% among 18-34 year olds. The data presented come from Vox Pop Labs’ post-electoral study, which surveyed a web panel of 4635 individuals, between the 10th and 25th of October 2018. For comparison, a probabilistic sample of 4635 respondents would have a margin of error of 1.4 percentage points, 19 times out of 20. The data have been weighted by gender, age, education, language and region to ensure that the sample’s composition reflects that of the actual Quebec population found in census data and other population estimates.